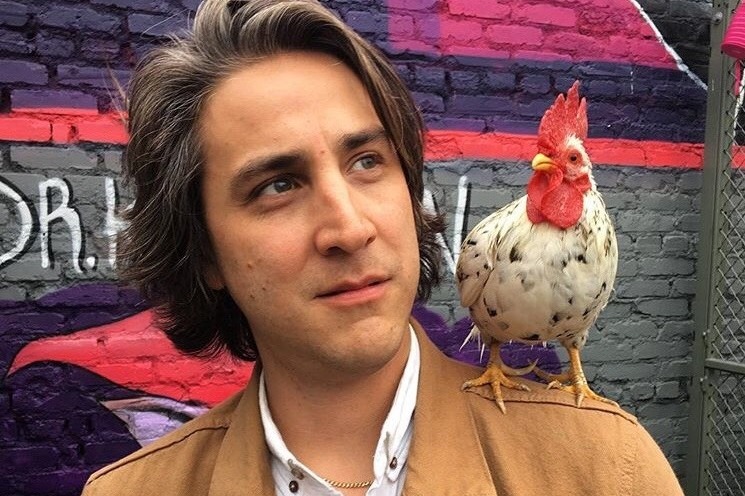 This past weekend our friend and fellow comic, Jason Saenz had a major accident in which his spine was badly injured after falling through a skylight on the roof of an apartment building. He's currently paralyzed from the waist down and will be facing a very long road to recovery. Right now he's in the ICU at Cedars-Sinai and will be entering a rehabilitation center as soon as possible to improve his path to healing. The good news: Jason is the kind of guy who can get through a challenge like this with humor ✔️hard work ✔️ and determination✔️. The bad news: the cost of his care is going to be exorbitant. Jason had been working at a new job and his health care was set to begin January 1, 2019 - which means he was not covered at the time of the accident. As of now, to cover emergency room costs, spinal surgery, an extended stay at Cedars-Sinai, months of rehabilitation, not being able to earn an income while recovering, and multiple other expenses we need to help him raise hundreds of thousands based on numbers and estimates we've been hearing. The faster we can fund this to get Jason started with treatment, the better his prognosis will be. He's in good company right now with his family who was able to travel to Los Angeles quickly after learning about his accident. No one is ever prepared for something so devastating and that's where we his friends want to pull together and show love and support by helping with this immense financial burden. All proceeds go directly to Jason and his family. Some wonderful people have donated some awesome items that you’ll want to bid on! Go To It! Just go to the Link below and start bidding. It’s that EASY!! YES it’s True! Don’t forget it’s not too late to purchase Tix to the benefit Comedy Shows either. NYC, LA and DC set for next week!!! 3 cities! 3 shows! 1 Great Guy! All proceeds to go to Jason’s medicals costs. #TeamJason was able to secure LA, NYC, & DC! All three shows happening within 48 of each other! 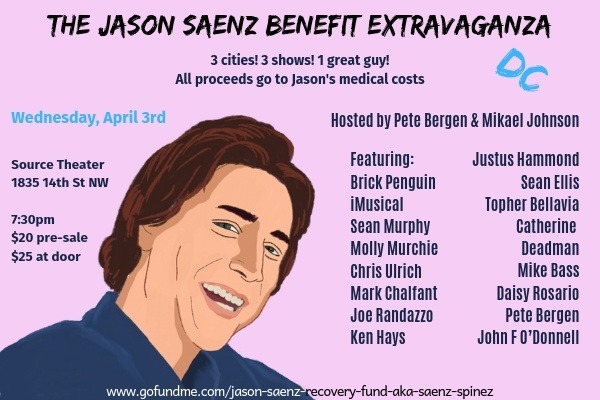 The Jason Sáenz Benefit Extravaganza - NYC! Team Jason wants to Thank You ALL for being a part of Jason’s recovery and for your generosity! Please keep sharing Jason’s story, every $5 and $10 donation Jason receives adds up. Helps us to get closer to our goal and getting Jason the care he needs. We are Grateful to have a loving, caring community out here with us! Many of you have been asking when the comedy show fundraiser is happening and we’re excited to announce we now have dates! Let’s share the LOVE for this Great Guy and spread the WORD to support his continued recovery by attending a Comedy Show to benefit our FRIEND Jason Saenz!!! #TeamJason wants to thank ALL of YOU for your continued Support, LOVE and constant Prayers!!! Jason is still recovering from his last surgery making good progress and his Spirit is HIGH! He will soon be moving back to the rehabilitation institute to continue the hard work he abruptly left a month ago. We will keep you All posted. 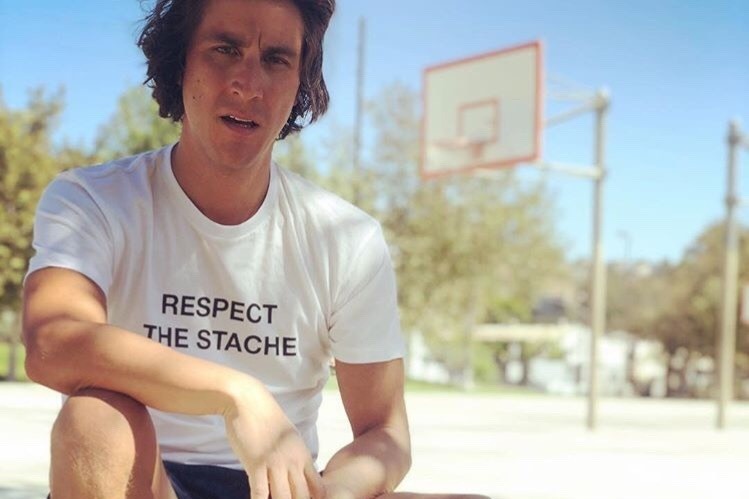 Join us in sending continued Love, Laughs & Positive Vibes to our Friend Jason Saenz. See you at the Show! We are happy to report that yesterday Jason underwent the second & final surgery to repair the pressure wound and his doctors are pleased with the outcome. He will now have to rest with no physical therapy allowed for the next three weeks. He’ll then head back to the rehab institute to continue with his physical therapy. We’ll make sure to keep you informed of all his milestones, as we know you all are thinking of him. Team Jason wants to Thank You All for being a part of his recovery and for your generosity! Please keep sharing Jason's story and sending him positive vibes. Every $5 and $10 donated adds up and helps us to get closer to our goal and getting Jason the care he needs. Thank you for taking the time to read this update! Enjoy the weekend & stay safe. We wanted to give the community an update on Jason’s recovery. As you all know Jason has been in his 2nd phase of his recovery working on his physical therapy. He’s been working really hard to regain his strength and progress has been made there. While at rehab his wonderful doctor’s noticed a pressure wound that wasn’t healing as quickly as they’d like so we are now back at Cedars where Jason successfully underwent one of two surgeries to repair the area. He’s doing well but disappointed that his physical therapy is on hold for a few weeks while undergoing this treatment. In true Jason style he was overheard last night speaking to his nurse and telling her "he's been working shows at different hospitals to raise money for spinal cord injuries." Gotta Love him and his spirit. :) As soon as he recovers he’ll go straight back to rehab to continue working on his physical therapy. Jason and his family are so grateful to ALL of you for being here for him and for your continued support and positive vibes. Please continue to share Jason’s story every donation no matter how small makes a huge difference for him. Every $5 & $10 donated adds up to get us closer to our goal and allows us to get him the Best care possible. We’ll continue to update you with each milestone. Without you Jason would not be able to solely focus on his recovery. You ALL have given him the ability to not be worried or stressed about how to fund his health care and recovery, Jason is immensely grateful and loves you All. Thank you!